Adam Springer is the son of firm co-founder, Howard Springer. Adam is the current Managing Partner of Krivitzky, Springer & Feldman. He was born and raised in Montville, NJ and currently resides in Rockaway Township with his wife, Bronwyn, a schoolteacher. He received his B.A. in Economics from Columbia University in 1991 and his law degree from Fordham University School of Law in 1994. 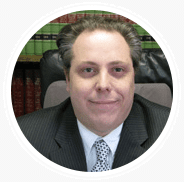 For the past 20+ years, Adam has focused on civil cases including automobile accidents, vehicle accidents, falldowns, and other types of injury cases. Fighting for the injured, big case or small, he strives to deliver personal attention to his clients’ needs. Aggressive advocacy, tempered with compassionate guidance, is his benchmark. As he endeavors to achieve maximum compensation for all of his injured clients, his greatest satisfaction comes from knowing that many of his former clients continue to refer family and friends to the Firm when they have been injured.